This presidential election season seems to be made for social media. While Facebook and Twitter users have been posting memes, praising and griping about the candidates, and arguing with friends and family about the issues for months, last night they took to social media in droves to comment on the first presidential debate. Republican candidate Donald Trump faced off against Democratic candidate Hillary Clinton in the debate held at Hofstra University. While Democrat Hillary Clinton and Republican Donald Trump sparred over trade, jobs and fighting ISIS, among other topics, Twitter users, who were able to watch the debate live streamed on the site, commented throughout the debate and retweeted debate points and graphics put out by the campaigns and political parties. According to Twitter, it was the most-tweeted debate in the service's history, although the company hasn't said how many people were tweeting or how big the spikes in traffic were. However, Twitter said the most tweeted topics were related to the economy, foreign affairs, energy and the environment, terrorism and guns. 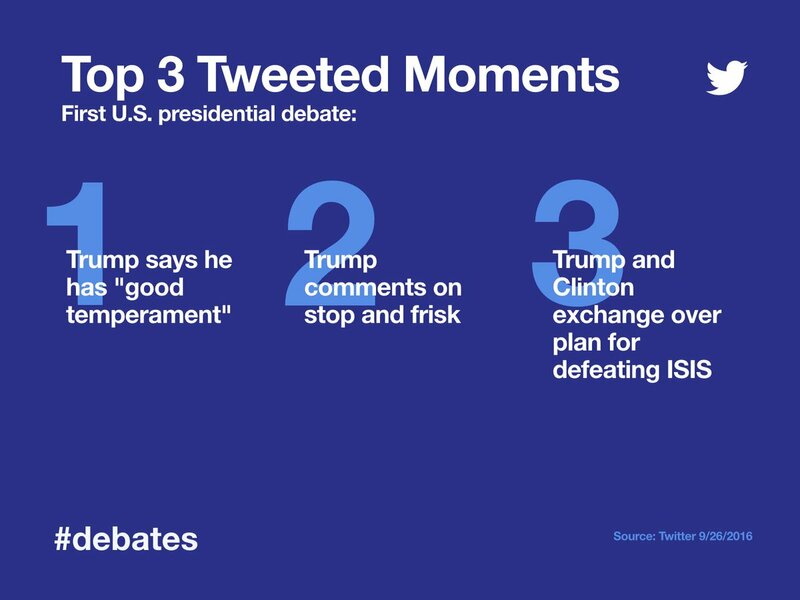 The most tweeted moments came when Trump said he had a good temperament, when he commented on stop-and-frisk, and when the candidates talked about their plans for defeating ISIS. Twitter also reported that 62% of the Twitter conversation was about Trump, with Clinton accounting for 38%. Twitter also lit up when the Trump campaign deleted a tweet Trump had previously made about global warming. 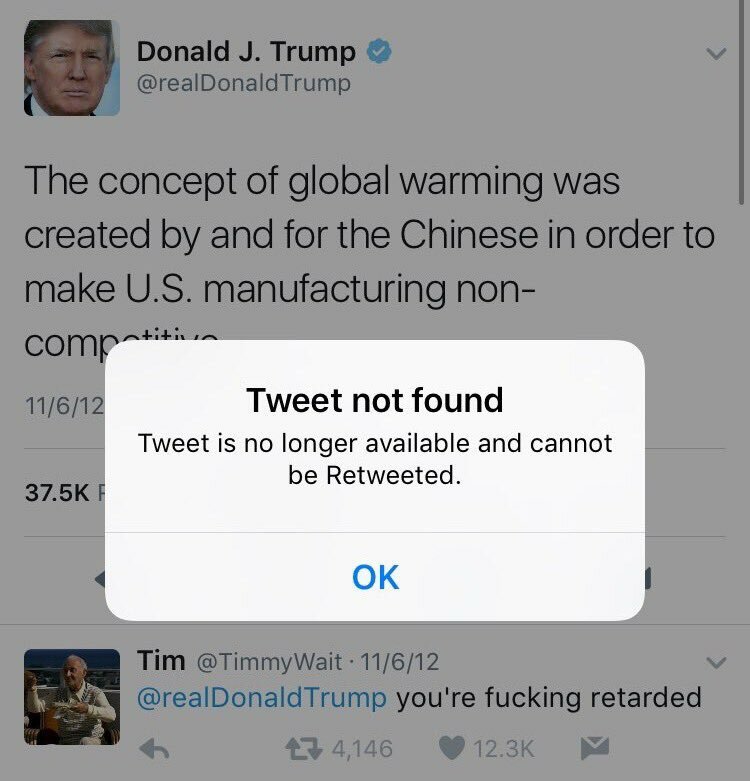 During the debate, the candidate claimed he had never said that global warming was a Chinese ruse, and then the tweet where he made the statement was removed from the site. Twitter users quickly picked up on the move and passed around the information. "Because he had made the tweet, Twitter was a reference in the debate itself," said Ezra Gottheil, an analyst with Technology Business Research. "Twitter was Trump's virtual paper trail… Twitter is the logical place to discuss immediately current events, but also Twitter is particularly relevant in this election because the campaigns, especially Trump's, use Twitter as a major communication channel. "You could call this the Twitter election," he added. Facebooks users also posted comments to their news pages, and the social network's trending topics Tuesday morning were focused on the debate, as well as celebrities and sporting news. On Twitter, trending topics ranged from Fact Check, which had 105,000 related tweets Monday night, and two expressions that Trump used during the debate: Bigly, which had 23,000 tweets, and The Cyber, which had 46,000 tweets. During the debate, dictionary publisher Merriam-Webster tweeted that Trump repeatedly used the term "braggadocious." "He was trying for braggadocio. #debatenight #debates," the reference company tweeted. Merriam-Webster also tweeted that during the debate people were using their online site to look up braggadocio, cyber, cognizant, temperament and stamina. "Lookups for 'temperament' are up 78 times over the hourly average. #debates #debatenight #Debates2016," the company tweeted. Today, the company tweeted, "Words matter."